The shorter the better, especially in an emergency, as every second counts when you are calling for help. In addition, many in the sailing community feel you should try to limit a boat name to one word. You don’t want to tempt the gods of the sea one way or the other. Names like “On the Rocks” or “Bottoms Up” may turn out to be more appropriate than you ever intended. By the same token, if you name your boat “Titanic”, or anything else that implies un-sinkability, are just asking for it. Guys: yes, your boat is a “she”. But before you name her after your wife, think about this: What if, even after that grand gesture, she still doesn’t appreciate the boat? Or, if she shares your love of boating, what if she is simply uncomfortable with the idea of sharing her name? NSFW is a term born on the Internet to describe content that is inappropriate, as in “Not suitable/safe for work”. 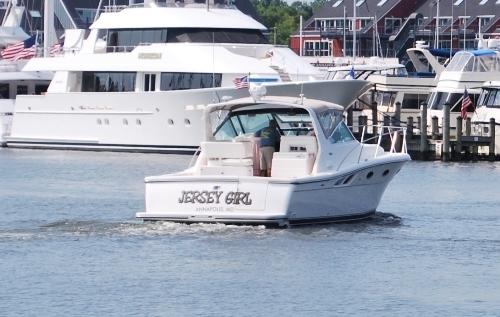 Is your boat name appropriate for kids to see? Will your boss or clients be on the boat, or will they be put off if they get wind of the name? Will friends and family be embarrassed or offended by the name you choose? 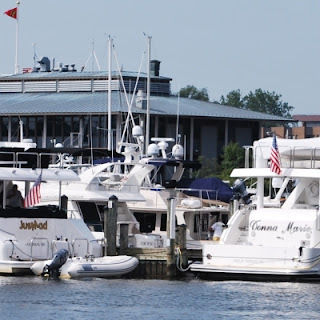 You don't have to be totally original, but avoid names already used in your harbor, or at least in your marina. There are no rules currently in the US about re-using boat names, but having the same name as the boat next to you is just silly. Imagine repeating your boat name several times over the VHF radio in a call to the Coast Guard or dockmaster, and all other boats within listening range. How do you sound? Now, add static and other background noise. Repeat. That’s so clever, we’ll say it again. A boat name related to your business can help you turn a sail into a sale ™.If you own a business or work for one that you’re proud of, name your boat something related to the company name and you’ll have a billboard on the water, or at least a conversation starter about what you do for a living. 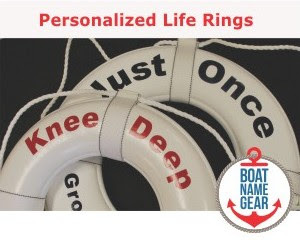 Is the dot-come domain name available to match your boat name? 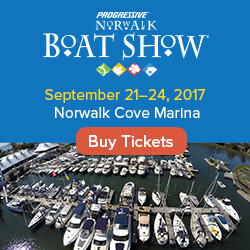 This could be of interest if you are a cruiser, live-aboard, race your boat, share it with other fractional owners, or if you simply want a blog about your boating adventures. Your boat name will be YOUR name. People you meet may not remember your name, they will remember you by your boat name. This is exaggerated for cruisers and live-aboards. The owners of the Mary-Jane become known as “the Mary-Janes”, the owners of the Jenny become “the Jenny’s”. You get the picture. Do you really want to be known as the Aqua-Holics? It is not bad luck to re-name a boat… as long as you christen the boat properly. In fact, whether you buy a new boat or a used boat, always christen her with the new boat name. There are various boat naming ceremonies available on the Internet, but all you really have to do is pop open a bottle of champagne, splash some on the hull, and toast the new boat’s name with at least one witness. Oh, and make sure you say something nice and respectful about Poseidon and/or Neptune.